We’ve written about the Clarisonic Mia 1. Now, it’s time for Mia 2. How different is this version? What are the new features? Has it been received well by consumers just like the Mia 1? Read on to find out. But first… let’s start with the basics. Clarisonic has several cleansing collections. Notable of these are the Alpha Fit, Opal, Pedi, and of course Mia. The Mia collection focuses on the face, and so far it has four versions – Mia 1, Mia 2, Mia 3, and Mia FIT. In this article, we’re going to talk exclusively about the Mia 2. When you open your Clarisonic Mia 2 package, you should expect to find the following: the device, a sensitive brush head (normal brush head for grey device), a protective travel case, a sample size cleanser, and a universal voltage pLink charger. The pLink charger connects to the device through a magnetic body. This is unlike other brands that needs a port to plug into. With the pLink charger, all you have to do is to attach it to the base of the Mia 2 device. The Mia 2 is available in four colors – white, lavender, pink, and sea breeze. There are a few “variations” of the Mia 2. 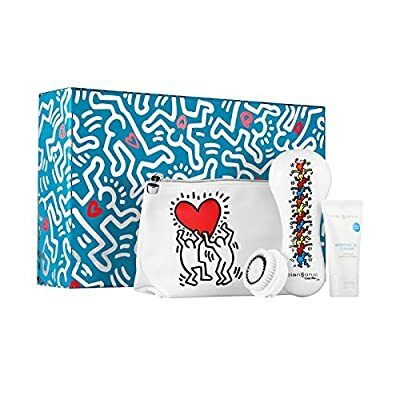 The Kieth Haring Value Pack (see image on the right), for instance, is a limited edition Mia 2 that includes a Keith Haring travel bag. Another is the Mia 2 Deep Pore Detoxifying Solution Kit. True to its name, this is for deep pore cleansing and includes a deep pore brush and and a detoxifying clay mask. You can also try the 5-piece Mia 2, designed for women. Aside from the charger and the Mia 2 itself, the kit contains a sensitive brush head, a refreshing gel cleanser, and a protective travel case. The Mia 2 has 2 varying sonic speeds in contrast with the Mia 1 that has only 1. These two speeds are labeled “delicate” and “universal.” Choose the “delicate” setting if you have compromised or fragile skin. Choose “universal” for normal cleansing. With a 1-minute pulsing T-timer, this device saves you time and at the same time eliminate guessing. A pulsing action indicates that you need to move to another area. Just like other Clarisonic Mia’s, the Mia 2 allows interchanging of facial brush heads, is waterproof, and is made in the USA. Plus, don’t forget the 2-year warranty. The first question is, does it improve your skin? The general consensus is that skin feels and looks cleaner, clearer, and smoother even after the first use. And although this facial cleansing device is a bit pricey, many users agree that it’s worth the money. With the Mia 2, you can notice that makeup is no longer a challenge to remove. With the Mia 2, imperfections such as flakiness, hyperpigmentation, and pimples can be minimized. Just like with any Clarisonic facial brush, you can experience a purging phase especially during the first two weeks of usage. But as others have suggested, the Mia 2 effectively brings out all the dirt particles stuffed in your skin, so the breakouts are the result of this purging action. It appears that if you forget or skip your Clarisonic cleansing, your skin problems can re-appear. For instance, in the video below, user Jaclyn says when she didn’t use her Mia 2 for two weeks, her bumps reappeared. This was also observed by one user who says a pimple appeared because she forgot to use the device. There are several reviews posted on a popular video sharing site. One of them is this comprehensive video uploaded by user Jaclyn Hill. She explains in full details the features of the Mia 2, how to use it, and what it did to her. At the end of the video, she gives us a demo. In the video, Jaclyn starts by saying that the Clarisonic Mia 2 has “changed my skin’s life.” She used to have “texture issues,” saying that she has dry skin and her face tends to get flaky. But with the Clarisonic Mia 2, her problems have been solved. She added that if she doesn’t use her Clarisonic, the bumps come back. ProX vs ProX Microdermabrasion by Olay, What’s the Difference?